Classical Chinese garden, are a special aspect in traditional Chinese culture and art. A garden is purported to meet man's demand for relaxation and lodging. A Chinese garden mixes man-made landscape with natural scenery, architecture, painting, literature, calligraphy, and horticulture. The classical Chinese garden originated in the Shang and Zhou dynasties, when monarchs began to build parks for their own leisure and pleasure. The construction of gardens became something of a fashion during the Spring and Autumn and Warring States periods, and by the Qin and Han dynasties the Chinese had already learned how to imitate nature in their gardens, and private gardens had appeared. During the Wei, Jin, and South and North dynasties, private gardens came in vogue as the rich and powerful sought to express their sentiment in landscaping. During the Tang and Song dynasties, a poetic touch was added to the layout and scenes of a garden, and became a general feature of classic Chinese art of garden construction. Chinese garden culture matured as a comprehensive school of its own during the Qing Dynasty, after the practice of many preceding dynastic periods, and rose to become one of three garden construction schools along with Western Asia and Europe. 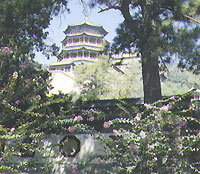 Classical Chinese gardens includes imperial gardens and private gardens. First, they can be classified into imperial gardens and private gardens. 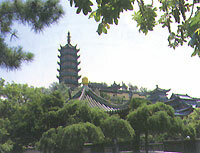 Second, in terms of geographical location, there are northern garden, which are mostly found in Van, Luoyang, Kaifeng, and Beijing, with those in Beijing as representatives; gardens in the lower Yangtze River valley, which are mostly found in Nanjing, Wuxi, Suzhou and Hangzhou, with those in Hangzhou as the most representative; and the Lingnan school of gardens, which are found in Guangzhou, Dongguan and Shunde. Third, the Chinese gardens fall into four categories, that is, imperial gardens, private garden, private gardens, monastic gardens, and gardens in scenic resorts. Famous monastic gardens including the Jinci Temple of Shanxi and the Tanzhe Temple of Beijing; whereas the West Lake of Hangzhou and the Darning Lake of Jinan belong to scenic gardens. Fourth, Chinese gardens can be classified into regular gardens, naturalistic gardens and mixed gardens. Generally speaking, most of the gardens in the West are regular gardens. Most Chinese gardens, be they large imperial gardens or small private ones, are naturalistic gardens.